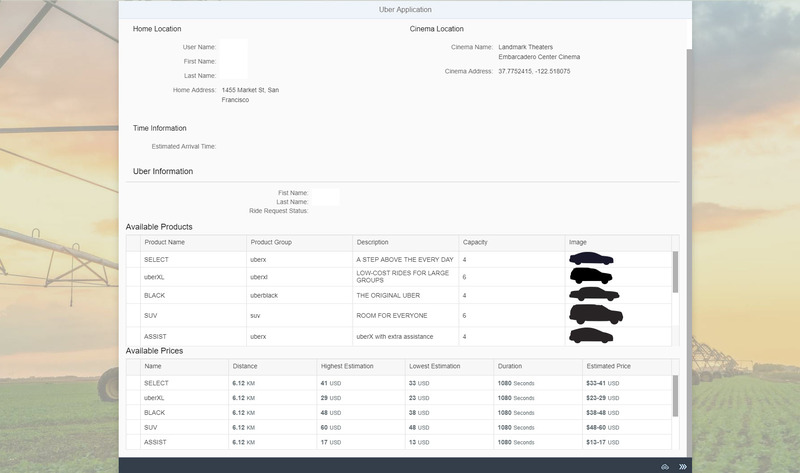 Customer wants to have capability to call UBER from a Fiori Launchpad after he/she books ticket online and needs go to cinema. Call UBER would be a good option to get to cinema. A PoC is build up for this purpose. Assume the current customer position (source location) and cinema location (destination) is known. We will focus on how to consume UBER APIs to call ride request from SAP UI5 application. Customer will have visibility of available UBER product and estimated price. Then customer can select which kind of product and request an UBER service. 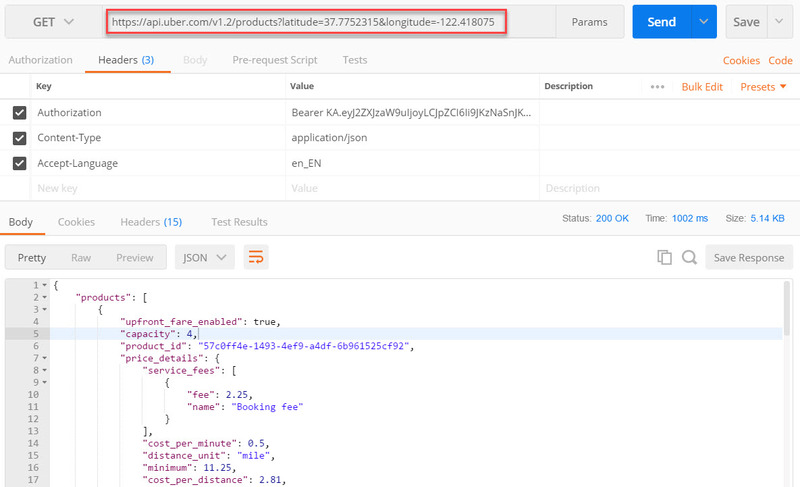 We can test web APIs with different tools. In my example, the tool “Postman” is used. The “Access Token” of the UBER app can be used here as header parameter “Authorization”. This request returns general information of registered UBER user. The current location (latitude&longitude) is passed to request URL to get available products on this position. The service will return detail information of available products. In this request, both source position and destination positon are passed to URL. System will return estimated prices based on available products. This request will return the estimated information for specific product and location information (source & destination location). The result of estimation will be used in the next step to create ride request. This service will create ride request of selected product and fare_id which was created in previous step. After service is posted, the request will be processed and waiting for response from UBER drivers. The status will be updated accordingly based on rider interaction. 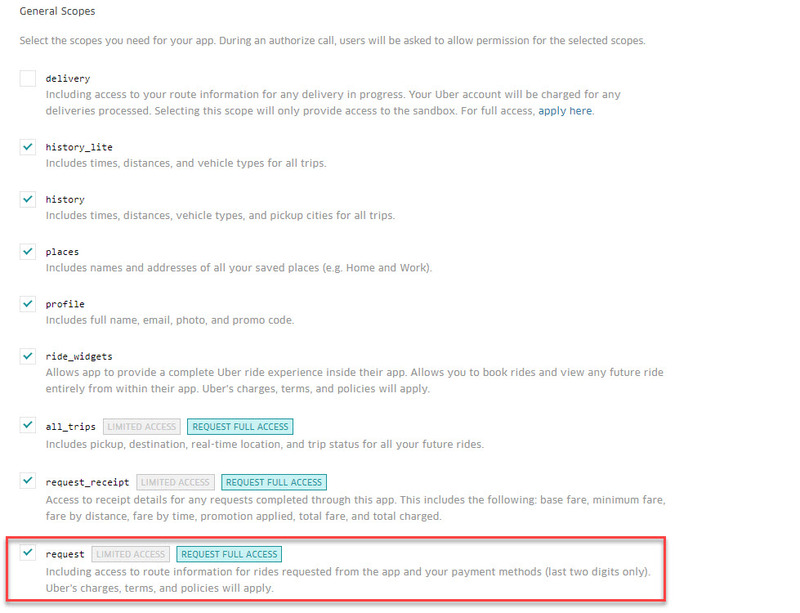 Note: the access token which is generated in the UBER app configuration page cannot be used to create ride request. Refer to next section for access token generation. replace all <PLACEHOLDER> in the URL. 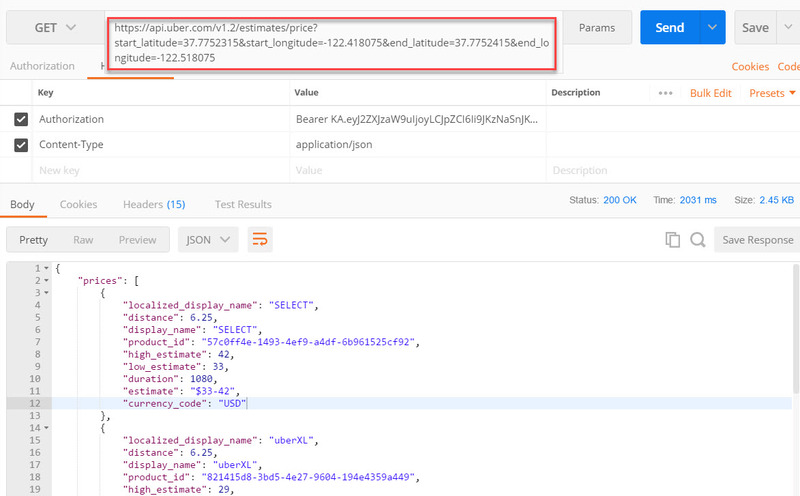 The placeholder <YOUR_CLIENT_ID> can be derived from UBER app admin page. You can leave placeholder <YOUR_REDIRECT_URL> blank and system will return authorization code in URL. Note: in the UBER app admin page, the “redirect URI” is configured as “http://localhost/”. So here the authorization code redirect to localhost. Copy the authorization code from returned URL. This code will be used to generate user access token in next step. 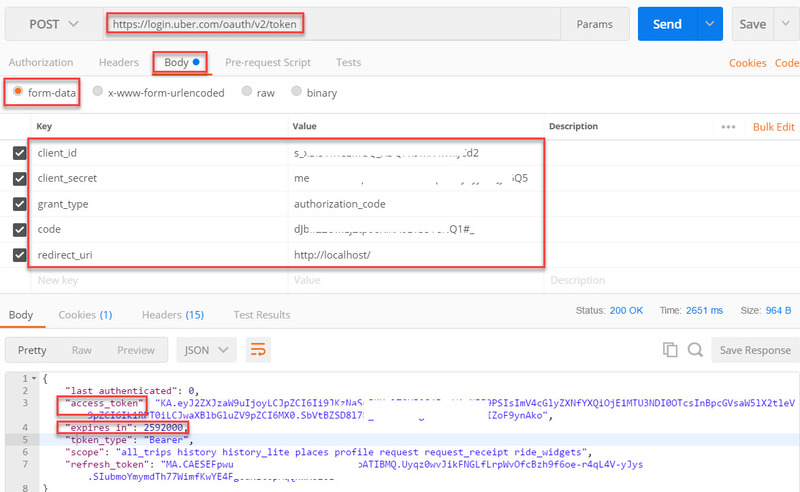 In this step, send request “https://login.uber.com/oauth/v2/token” with following parameter to get user access token: The access token has expiry time. So we have to refresh access token after it is expired. 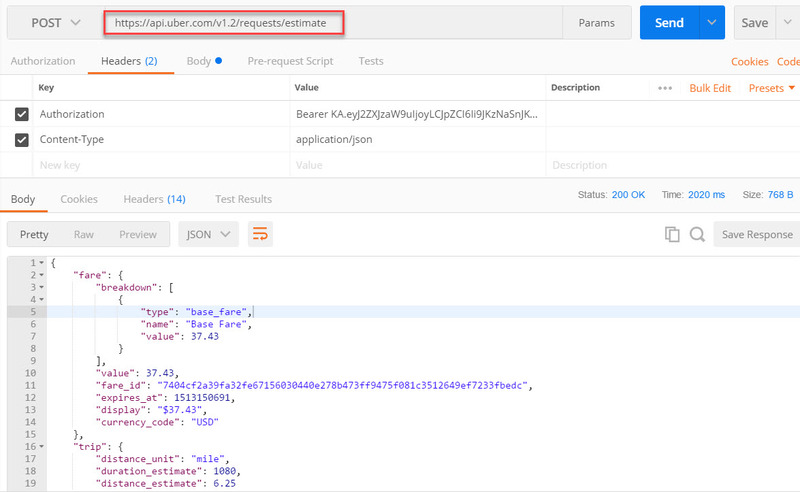 UBER API will reject request if the origin URIs are not defined in the UBER app admin page. To solve CORS issue, it is necessary to define origin URIs in the tab “Settings” of UBER app admin page. Nice! It is really a good example of OpenUI5 usage, no? Request….could you make the images clickable? This is one of PoC we made to integrate UBER APIs in SAPUI5 application, so only the simplest features are implemented. Regarding your request, what is your expectation after clicking images? I’m just wondering whether that is / should be a feature of the blogging platform itself, rather than individual authors having to build a mechanism for every post. yes. I have to go through each images and add links on them. It would be good if blogging system can do this automatically. @DJ it seems like some variation/iteration of the blogging component on here USED TO do that at one point. Yes, it did indeed. Would be nice to see it back again. Thanks for the wonderful blog. It is very well explained. I have followed all the steps you have mentioned. But I am getting issue related to CORS. Updated the controller with the Access token ,clinet id, client secret and other details. 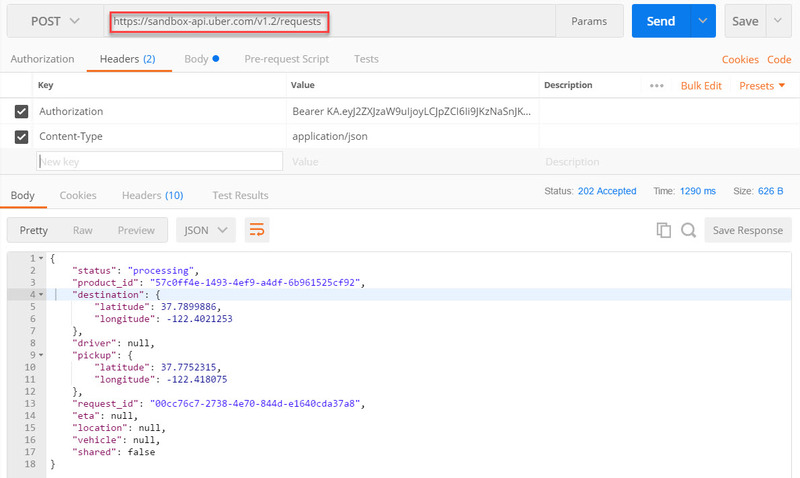 Can you add “https://api.uber.com” as a destination on SCP, and then using destination in the API calling? Thanks for your input. Yes, after adding destination in SCP its working fine now. Nice Blog with a unique use case. I am sure this will serve as a gr8 example for other similar use cases. Just one quick doubt, Do you have this code shared on Github? Its a little messy copying the code from here & pasting in WebIDE for quick testing. Please find code in the GitHub: https://github.com/zhaoyo/uberTest.